Welcome to the small and slightly creepy English village of Crowsbrook. 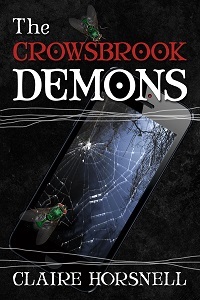 Crowsbrook’s hills, woods, and populace form the stage and actors of The Crowsbrook Demons, the first tale in a series of books all equally macabre. I’ve always had a fascination with witches: good, bad, it doesn’t matter. Witches get where they are through hard-won wisdom and knowledge, rather than relying on their looks, as princesses so often do. Our heroine, Sarah Trevelyan, is not a princess, but a witch. Capable both of great good and great evil. Very human. As the world that Crowsbrook occupies began to grow in my mind, it became clear that the story was about more than just the challenges a witch might face in the modern world. This was fertile land.